How Safe Is AT&T's Dividend? The telecom industry has been among the most generous sectors of the market in terms of sharing profits with shareholders through dividends, and industry giant AT&T (NYSE:T) is no exception. For a long time, AT&T has been among the top dividend stocks in the market, paying investors solid returns on huge investments in network infrastructure. More recently, though, rising competition in the wireless telecom industry has put pressure on AT&T and its peers, and some investors fear that a hit to the company's dividend might follow in the future. The following analysis looks at AT&T to see whether investors can rely on its quarterly payout going forward. AT&T's high dividend yield satisfies many income investors, but those who are more conservative can get nervous about a yield that's too high. Other companies in the telecom space have had to reduce or even eliminate their dividends recently after having sported extremely high yields, and once-burned income investors want to make sure they don't repeat that experience. One sign of stability is that AT&T's yield has stayed in a consistent range for years. The yield has gone as high as 6% and as low as just over 4% since the early 2010s, mostly following the ups and downs of the stock price. With the current figure near the midpoint of its range, investors can feel at least somewhat more comfortable that AT&T is in well-charted territory as far as dividend yields are concerned. AT&T has a payout ratio above 90%, which at first glance might appear troublesome. The challenge that often comes up in evaluating telecom stocks is that companies tend to have extremely large depreciation and amortization costs that tend to depress earnings compared to available free cash flow. As a result, telecom companies can sustain payout ratios well over 100% for extended periods of time simply because there's so much downward pressure on reported earnings due to non-cash items. AT&T's payout ratio has fluctuated greatly over the years, usually because of periods of one-time charges or benefits that reduce or inflate earnings. The current figure is consistent with what AT&T has seen over time, and investors just need to watch closely to make sure that nothing happens to make it climb substantially going forward. AT&T has a track record of consistent dividend growth. 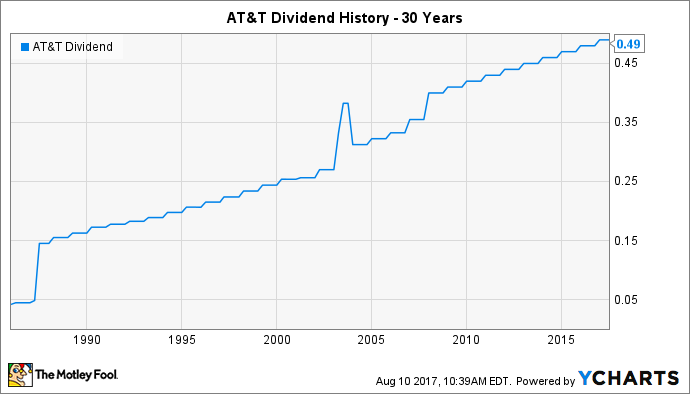 For 33 straight years, AT&T has raised its dividend payments each year, making it a Dividend Aristocrat. Those boosts have come even during times of great disruption for the telecom industry, including the years in which AT&T and its rivals were spending tens of billions of dollars building out or improving their wireless networks. T Dividend data by YCharts. Note: Spike indicates one-time calendar-year timing issue. AT&T's dividend growth isn't all that exciting, but it is consistent. January's 2% rise in quarterly payments is similar to what investors have seen in recent years. Over time, those small increases add up, making the stock predictable for those who focus on reliable dividends. The biggest uncertainty that AT&T faces is what comes next for the telecom giant. Throughout the industry, carriers are fighting each other over unlimited data plans that threaten to narrow profit margin and take away a key driver of future growth. AT&T has already had to cut prices in response to competitive pressures, and further moves could be necessary if the price war continues. Still, AT&T has ideas on where to go from here. The most important are its efforts in the media space, where it has already purchased DirecTV and is aiming to complete a takeover of Time Warner in the near future. By adding content, AT&T hopes to create an enclosed ecosystem with which it can woo subscribers, aiming to differentiate itself from other carriers. Companies throughout the media and entertainment space are looking at similar moves, however, and so investors can expect a tough fight ahead even if AT&T does get the Time Warner deal past all of its regulatory hurdles. AT&T has a lot invested in its reputation among shareholders for safe, growing dividends, and the company will do what it can to protect and preserve that reputation. With major capital expenditures on the horizon, AT&T will once again have its resolve tested, but past experience suggests that the telecom giant will be reluctant to make any move that would disappoint investors on the dividend front.